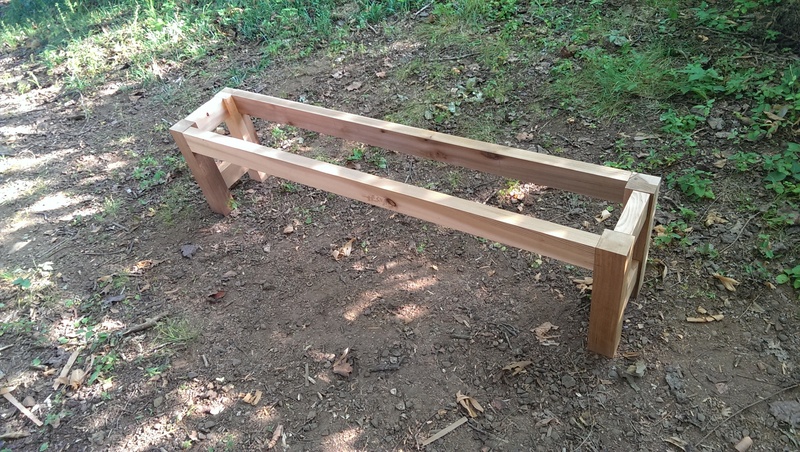 The benches, and thus the project, is complete. The last bit of work involved picking up a bit more teak oil. The total used on the project was just over a quart. 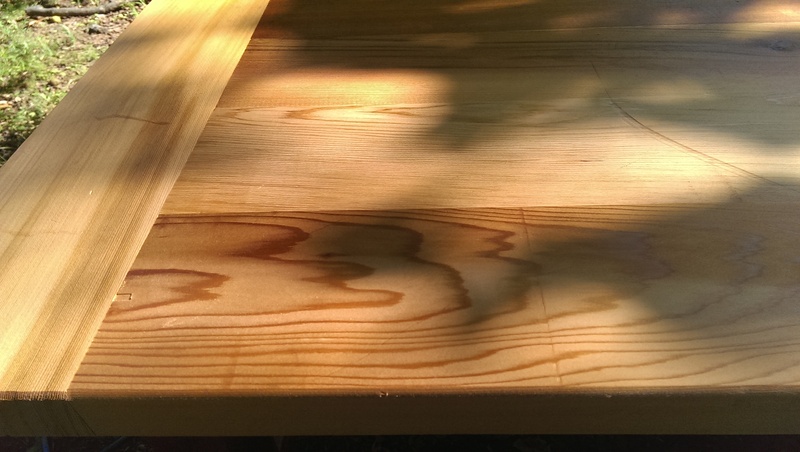 I finished up the second bench top and turned to the first – for some reason, there were large areas that were uneven with the finish. I took the top down to 60 grit and worked my way up, and gummed up quite a bit of paper. The result was worth it though, after I rubbed on another two coats. With the finish done on the project, I had to turn to a way to attach the bench tops. On the table, I used a total of ten attachments, with mortises cut into the inner rails of the base. I couldn’t really do that here, with the base being so narrow. 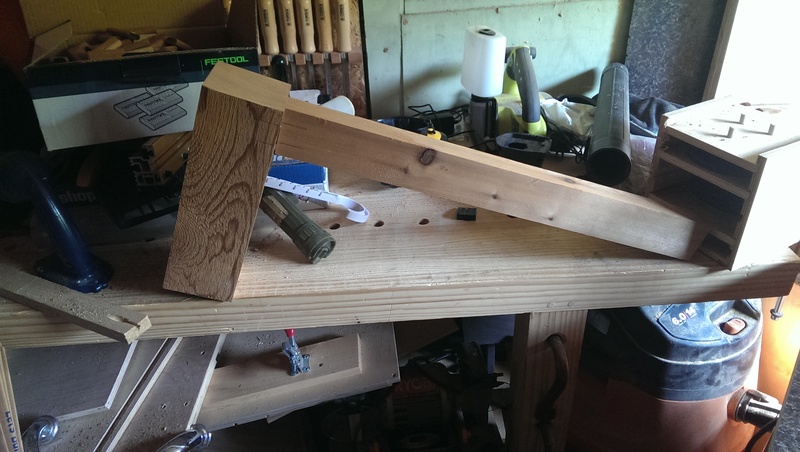 I set about making the stock anyway, trying to figure out a way I could use the new, beefier anchors on the table and the benches. I figured out that if I set the Domino at 25mm to compliment the 30mm holes already drilled, it would be a good way to go. I could also take care of any peaks where it didn’t overlap with a mortising chisel. So, that takes care of the weak attachments for the table, but the problem still remained with the benches. I turned to the router, where I hoped a rabbeting bit would at least get me close. Unfortunately, I didn’t have enough depth on the bit. Back to square one. Then by a stroke of luck, I found that the Domino just fit between the leg posts. It would be enough. 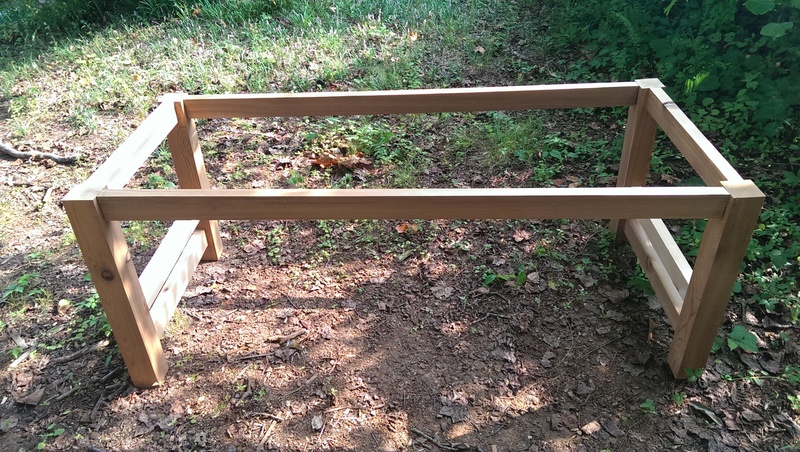 So the benches only have two attachments points on the ends, but I think it will be okay. I batched out enough for the table and benches, plus have enough to repair any that break. I actually have a board of it with instructions so I can duplicate the feat for another project. I thought I mentioned it before, but I put a small chamfer on the bottom of all the bench legs, since I know they will be moved around much more. I did all of them except the first pair I glued up, so I had to break out the plane for two edges that I couldn’t do on the router table. 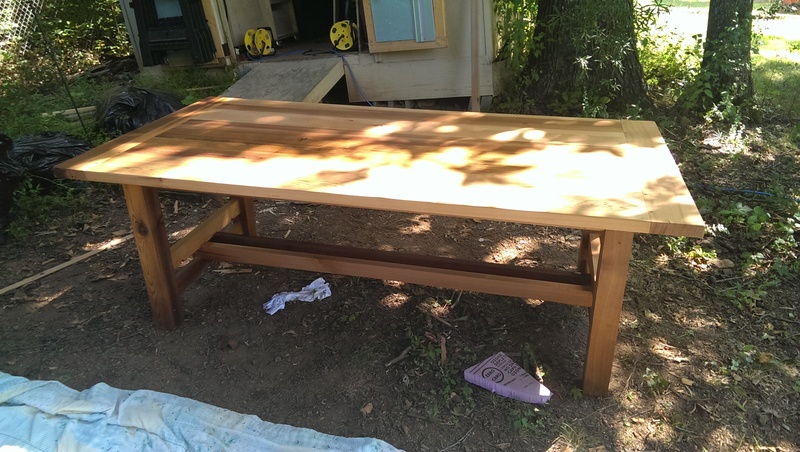 On Saturday the table was picked up, and my friend seemed really happy with it. I wish I had time to sand it down a bit better to hide the planing marks, but I’ll get to it down the road. After it was picked up, I got a message that the mounting blocks broke – I anticipated it when I realized how narrow I made them. Everything else though, I was pretty satisfied. Seeing the light at the end of the tunnel, I decided to press on and see if I could get the benches done by Labor Day. Unfortunately due to some sciatica on Sunday I could not. However, I did make some progress but only took two pictures below. 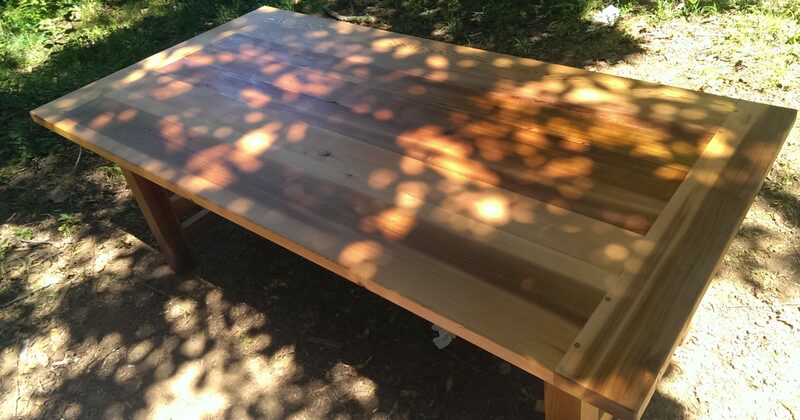 On Friday I cut all the remaining pieces except for the bench tops and glued up the bench legs on the table outside. I also got the stretchers cut and processed down to dimensions in preparation for Saturday. With the bench legs glued up, I ran them through the jointer and planer to 2.5″ square. I then marked the legs and stretchers for mortises and took care of those. I planned for a shadow line on both long and short sections, but a mistake in cutting the mortises for the long sections meant they turned out flush. I could have fixed, but it seemed like it was way more trouble than it was worth. The bases went together much like the table base, but without the trestle, so it was easier. There is a curve on the lower rail, though. I believe I got one completely done with finish on Saturday. On Sunday, I woke up with a huge knot over my sciatic nerve, and walking was an issue. I decided it would be in my best interest to take the day off. Monday was an easy day, finishing up the second base and applying finish after sanding. I then processed all the bench top boards, a simple process considering they already had one true corner from before. I cut to rough length, ran through the planer down to just over 5″, and did the glue-ups in two batches. 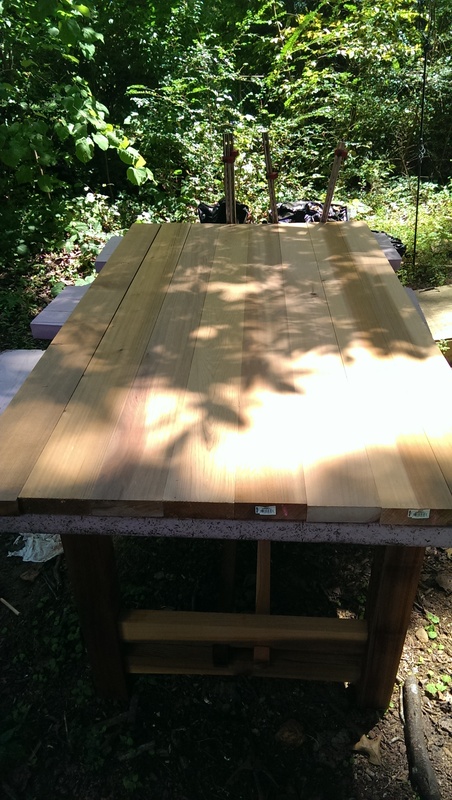 I even got to put finish on one and a half of them – I ran out of teak oil. So, the project is nearly complete. I just need to grab some more oil and finish up the tops (with a second coat as well) and attach them to the bases. This second part will be a little tough – I can’t use the Domino because the opening is too narrow. I thought about alternatives, and I think the router with a rabbeting bearing bit would be my best choice. I’ll test on some scrap wood so I can line it up with the Domino so I can make a big batch of these block connectors. Remember, I have to replace the ones on the table. 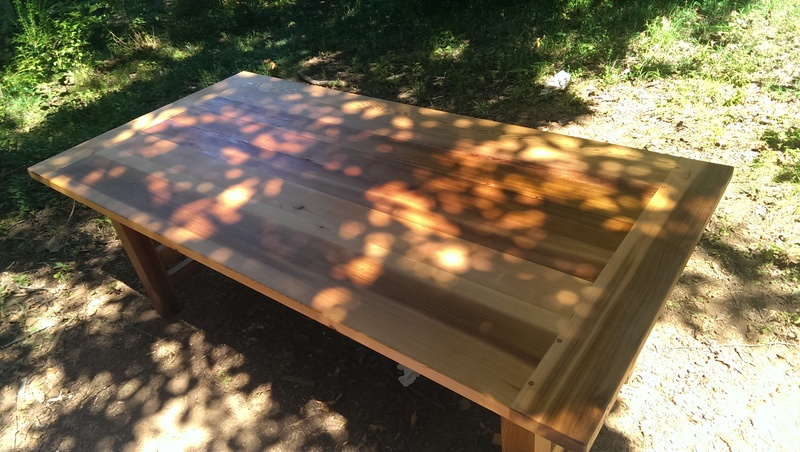 Wrapping up the last day or so of this build, I got the breadboards done and installed, the finish on the table top, and the top attached to the base. I did all of this on Monday and Tuesday, putting in a marathon effort on Monday with no food or drink. Not very wise, but sometimes you find a will. 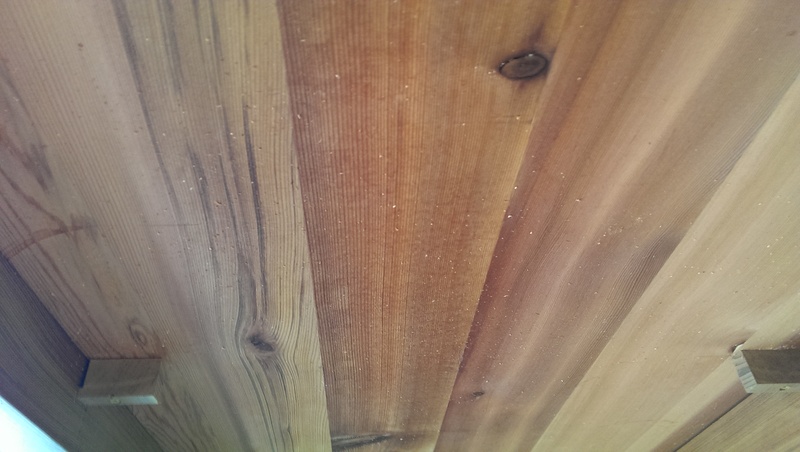 I trimmed up both edges of the table top and did some minor sanding. 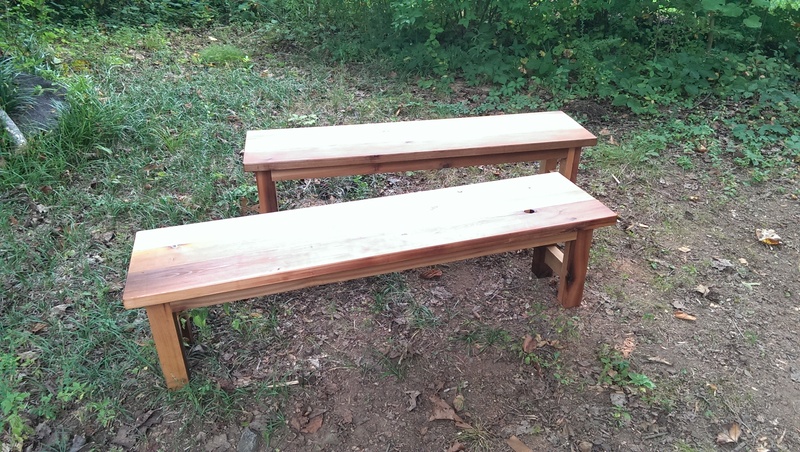 The breadboards came from two separate boards owing to remaining materials for the benches. I cut them at the miter saw and got my Domino out to cut the mortises on the table top. I plunged all six mortises and then noticed what appeared to be a huge mistake – all the mortises were way too low, toward the bottom. With people leaning on the breadboard ends, this could never even remotely work. 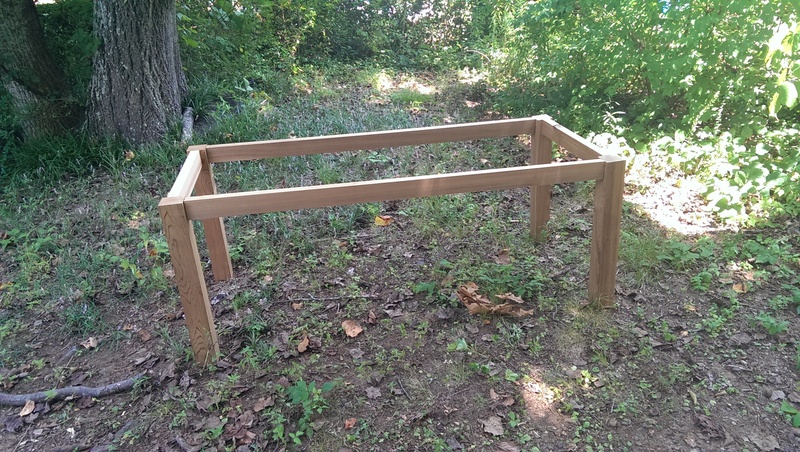 Seizing on an idea, I reset the fence on the Domino and made additional mortises just above the ones I had just done. 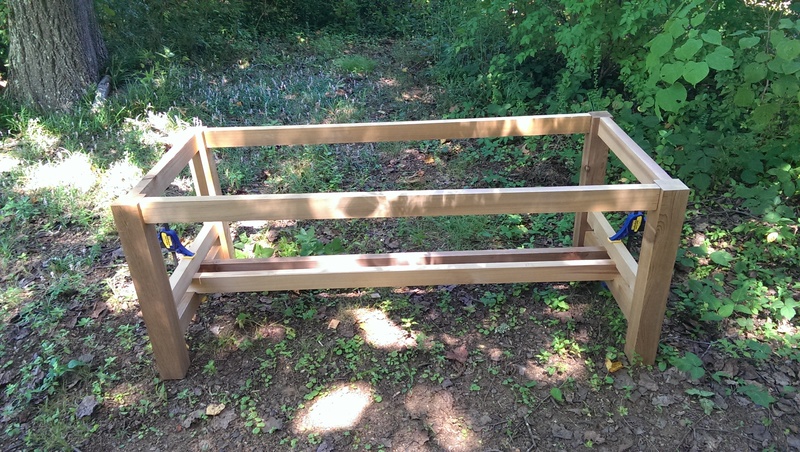 What was a mistake turned into a design feature – double mortises. In doing this, I would also be able to eliminate the support blocks I was thinking I would need. A bit of good fortune finally smiled upon one of my projects. I used actual-width mortises on the middle two, and extended-width on the outside six, just like in TWW’s video. I moved on to the other side, and unfortunately that good fortune was taken away as I forgot to set the width back and made all the mortises extended on one row. At this point I was committed to the build at hand, so I corrected my mistake on the bottom row – the two upper middle mortises would just have to be what they were. Satisfied with the dry fit on both ends (and after running them through the jointer for a fitment fix) I glued the middle two tenons on both rows on both ends on both sides, and the rest of the tenons to only the table. The breadboards went on and affixed with clamps. It came time to attach the two major pieces, so I brought out a spare mattress and laid it on the ground to help protect the top, which was put upside-down on the mattress and the base over it. After careful measuring, the base was centered and ready to be attached. 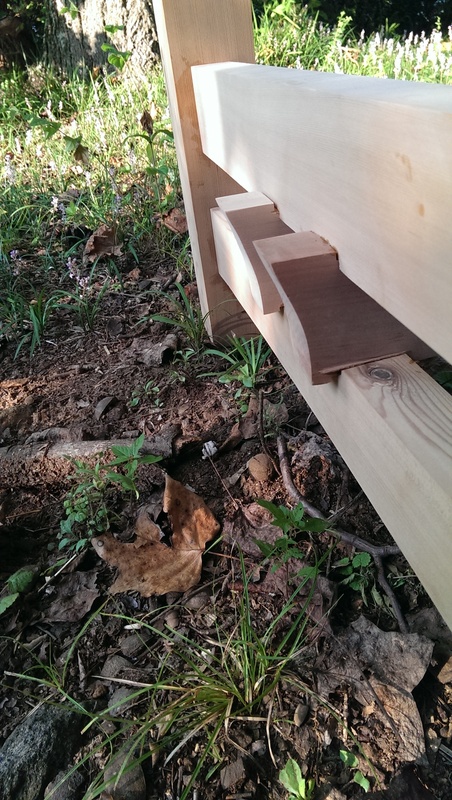 I used the Domino previously to cut mortises to use with cedar attachment blocks. I made the blocks, predrilled holes and it all went together, leaving room for movement. I will say that if these fail (and I expect they shall), I will go back and widen the holes and use beefier blocks – something that I thought of afterwards. Not a huge deal at all, won’t effect the table in any way. I can easily have these ready to go once I have a handle on just what the scrap situation is after the benches are done. Speaking of the benches, I was really hoping to be started on those by now. It is Thursday before Labor Day, and was hoping to have at least one close to ready for this weekend. There is still time, and the remainder is fairly easy, but it still takes energy and a lot of sweat. This brings us current to August 23. It’s been difficult to find time to write lately. I started school last week, and every spare moment at the computer has been spent either preparing for school or trying to get ahead on work. I suppose I have spent a fair amount of time de-stressing with video games. Now that I’m ahead a bit with school, I can devote a few minutes to catch you up on the table. 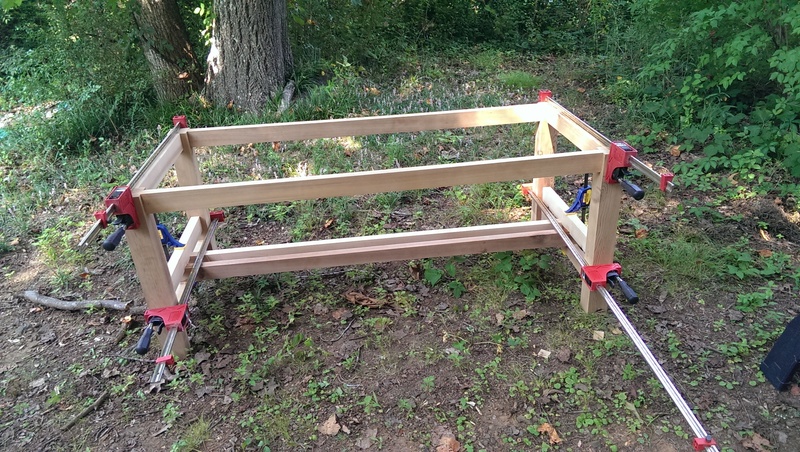 I was able to modify the mortises on the trestle like I described and it went together great. There is a small gap on the laps, but otherwise it looks really good and it is really strong. Ties the whole base together well, and looks pretty good. I then put the curves on the required pieces, and I suppose it went okay. I see lots of waviness and errors, but others don’t seem to. Working with the sander was difficult due to missing washers, and the bandsaw was tough because of the length of the long parts. The ends went reasonably well. All this took place about a week ago. This weekend I was able to get a coat of teak oil on the base, and man does it make it pop. Finding epoxy for the contact points on the legs has been very difficult, and I am considering just using shellac or the teak oil. Just something that will keep water from wicking up. The top has gone fairly easy to this point. I considered using the track saw to trim up the boards, but settled on using the jointer to make one 90 degree corner, then through the planer to get right around 5″ wide. I glued the top in two sections, then together near the end of the day on Saturday. I had to jack plane the first section a bit to get level, but the second section went together much better. I sanded both sections with 80 and 120 grit, but that first section needs a bit more to level out the plane marks. The middle joint also still needs to be sanded, then bring the whole surface and sides to 220. I’ll probably also round the edges, and ask if the corners would like to be rounded. I think the sharp corners look better, but it could be a question of kid safety. Left to do for the table is to make the breadboards and attach them, sand, finish and make the attachment blocks. Now, I realized I might have an issue with the breadboards: with the original, the Domino XL was used instead of my Domino 500. The tenons here are about twice as long, up to 50mm longer. This would give considerable strength to that section, something I can’t do. I may have to make up some support blocks that attach to the base, and style them similarly to the ends of the trestle. This isn’t a difficult or time-consuming task, I’ll just have to see if they are needed. I’d really like to have the table completed in time for Labor Day, but I don’t think the benches will be. In fact, I don’t see how they could. I hope to be done completely soon after, though. Thanks to two great weeks at the beach, and other days away from the shop, it has been awhile since I have been able to update. I’m incorporating everything I have done up until now in this post because it’s too difficult to tell which days I have done what. This brings us current up to Saturday, August 9. Since the last update I had set all the boards in a stack to normalize while on vacation. When I got back, it was time to start cutting. I used the Festool track saw to cut all my rail pieces and cleaned up the cuts on the jointer. This produced my first error, a small one – I realized that the cut isn’t perfectly perpendicular, and on one of the rails it is slightly skewed. Not very noticeable, so I have left it. I then made the Domino cuts in all the base pieces and dry fit. So far, so good. On Saturday it was time to make the dado cuts in the trestle. This produced error number two, a much bigger one. Apparently when I made the Sketchup file and my cut list, there was a discrepancy: the pieces in 3D called for 3.5″ height, and my cut list was 3″ high. I did this to cut down on material, but forgot to factor it in when cutting the dados. As such, I cut each dado 1/8″ too deep. This is a show-stopper, not one I can fix or hide (I tried with scrap wedges). I have a query out as to the best course of action, but I think I’ll be offsetting the mortises in the rails to get everything looking and fitting right. 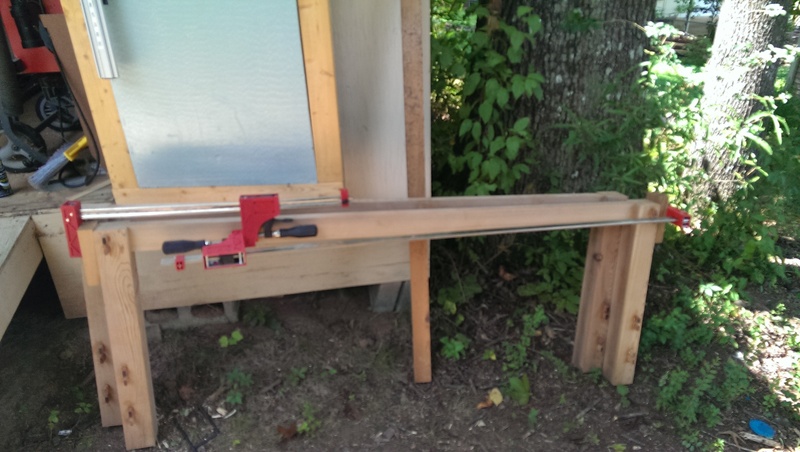 If I offset each rail by 1/4″, I’ll arrive at a good fit. I’m pretty sure I have enough room to do it, I just have to make sure I cut each one the right direction. IF I cut accurately, then I SHOULD have this problem taken care of with minimal fuss. 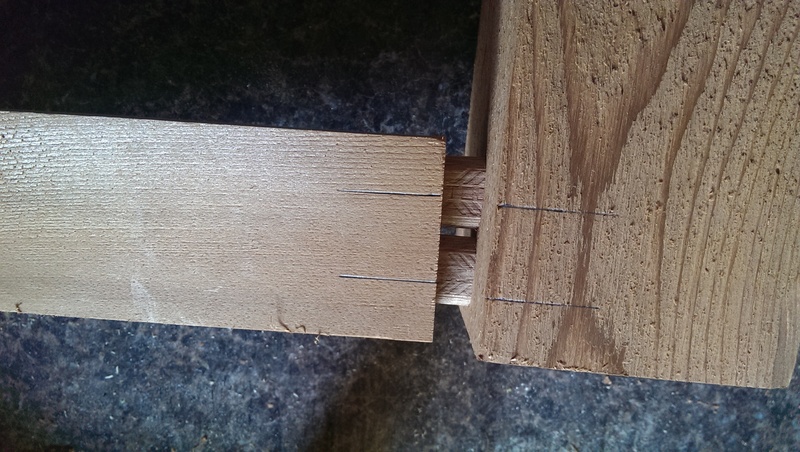 I’ll lose lateral stability on the mortises in one direction, but the lap joints being glued should mitigate that. I also don’t lose any stock for other parts. As far as time frame goes, getting the project done before school starts is nearly impossible now. I might be able to get the modification done today, and if it all lines up I can start gluing. However, humidity is extremely high and my space is small. Gluing might present a challenge over what I expected because I’m going to have to get the trestle assembly glued up at the same time as the rest of the build. We’ll see. I need to hop down to Highland when convenient and pick up epoxy and Teak Oil. 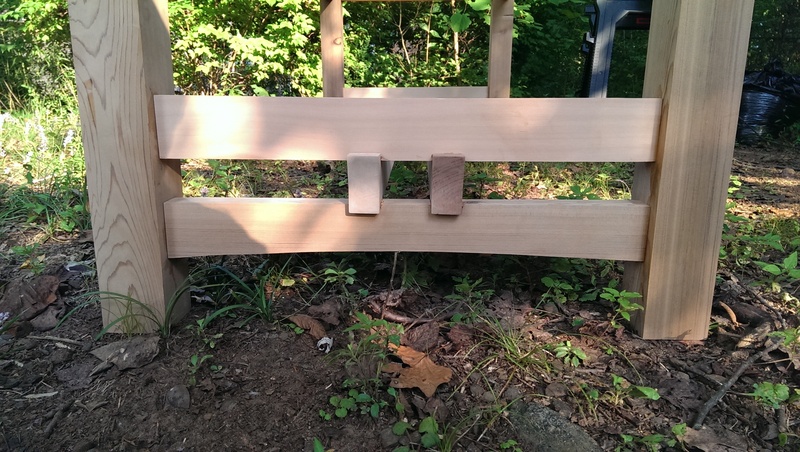 I had thought the next logical step after making the base was to make the benches, but I don’t know. They should go together fairly quickly due to the lack of a trestle, but it would be nice to have the table itself done. Down to the last three boards. These were processed in the usual manner. I then put them on the master stack along with the previously cut parts. This completes what I like to call Phase I. There still may be some dimensioning to do on various pieces, but by and large this portion of the project is done. What will happen now is that I will do some cleaning in the shop (to be discussed in a separate post) and start on Phase II. Phase II will consist of picking out the pieces for the top and cutting all the pieces out. I am going to wait several days up to a couple of weeks for all the boards to adjust to their new dimension and the relative humidity. There are internal stresses that are released when boards are dimensioned and trying to work with them right away can give poor results. Typically this is done in two or more stages, so as stated there might be some minor work to be done on some boards left. The most critical boards for this are the ones for the top. The remainder should be fine with a small bow as the joinery will help straighten it out. It feels really good to hit a milestone with this project. Wednesday was a very good day. The humidity and temps were low enough that I was able to process seven boards or so in the morning without breaking a sweat. I was so enthused I returned in the afternoon and processed five more. I still didn’t sweat as much as I did Monday morning. The process was the same, without too much issue. Run through jointer, then planer, then return to the master stack. I filled my separator up twice! I know immediately when the separator is fulled when using the planer, as I disconnect the vac hose, and I get showered with chips. The blower on the planer is that powerful. Makes a huge mess if it starts right at the beginning of a board, and especially bad if I’m doing a full width plane. Luckily with both instances I was cleaning up the edge of the boards. The humidity here is like a shower following you wherever you go. I went out to the shop today to start on processing the rest of the boards. I thought I would be really efficient and get them all done, but I was only able to do four. The sweat was pouring off of me onto tools and wood, so I decided to stop at an even number. As usual I ran through the jointer several times to get two adjacent sides squared up, then I ran through the planer on the other two sides down to what I needed. Since I pulled all the boards out at once and stacked them up, the processed boards went back on the sticker stack to adjust. Hopefully I’ll get all the boards done this week, everything will sit for a few days, and then it becomes crunch time – all the boards get cut into their respective parts and labeled. Then the first of August or so I cut Dominos and dadoes and we start dry assembly. Hopefully with the cooler and drier weather we are about to get I’ll be able to get the rest of the processing done without losing several pounds at a time. Short update today, I wanted to get comfortable with the new Domino cutter and see if I could get things planned out for the joinery. I ordered a 10mm cutter and a box full of 10x50mm mahogany Dominos from Amazon while the 10% off sale was running. The bigger tenons (versus the 5mm ones I have been working with) will provide a bigger surface area for the glue to adhere to and provide a stronger joint. 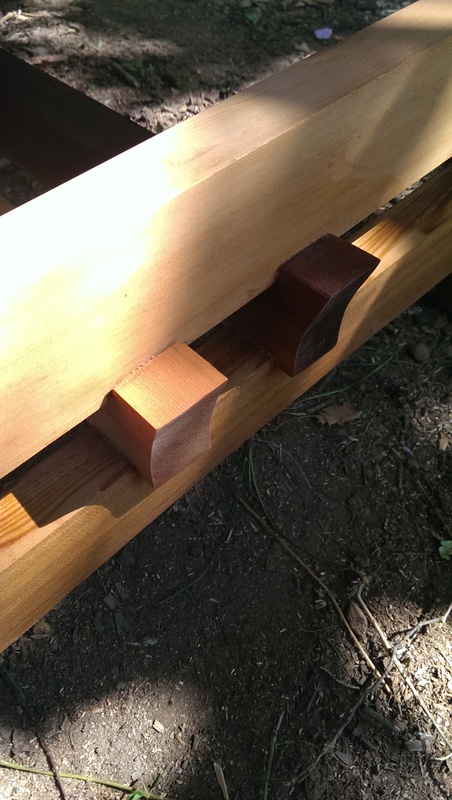 I will be doubling up on the tenons at each joint, strengthening it even further. I could probably use three or four, but that would mean trying to figure out double offsets and trying to get all that lined up. I think two will be fine. My comfort with the Domino is really growing, and it is showing in the joints. After forgetting to compensate for the offset, I decided for the 18mm fence setting for the 2×4 pieces, and a 30mm fence offset for the legs, giving approximately a 1/2″ offset for a nice look. I could have gone for a smooth look, but the offset just gives a nice shadow line and makes for a much more professional looking assembly. 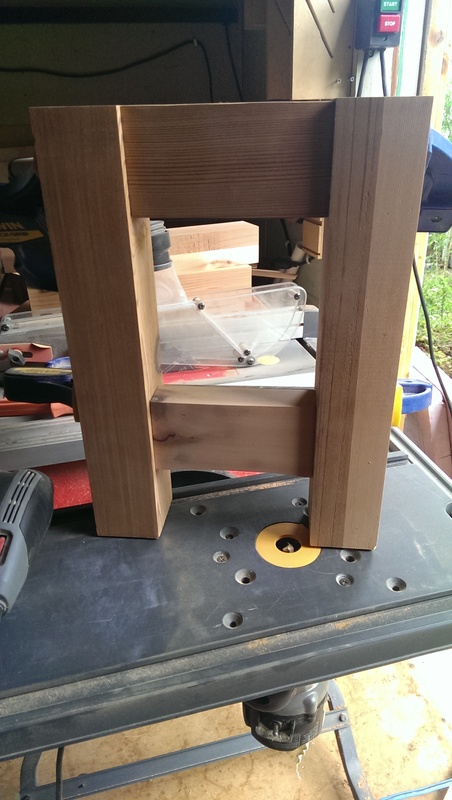 As always, the tenons fit in the mortises perfectly. 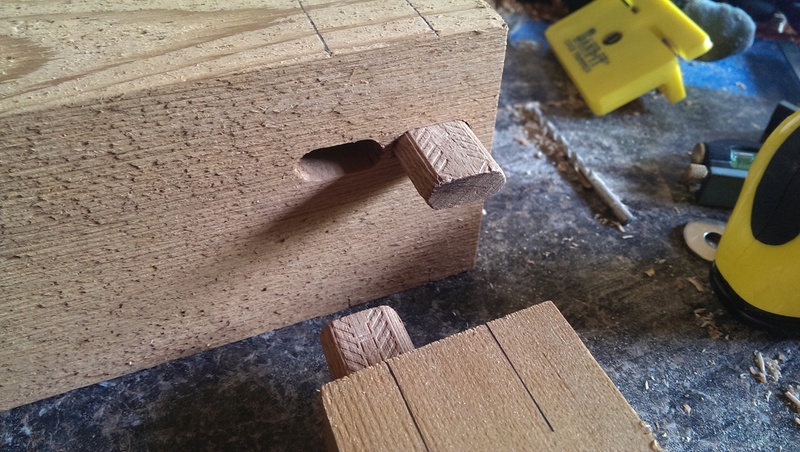 To get good clean mortises, the Domino requires patience. A firm grip on the tool and fence, the piece being properly supported, and a slow, even plunge. Suction to clear the chips is a must too. I think I will spend a little time this afternoon clearing up and preparing for the other board processing. 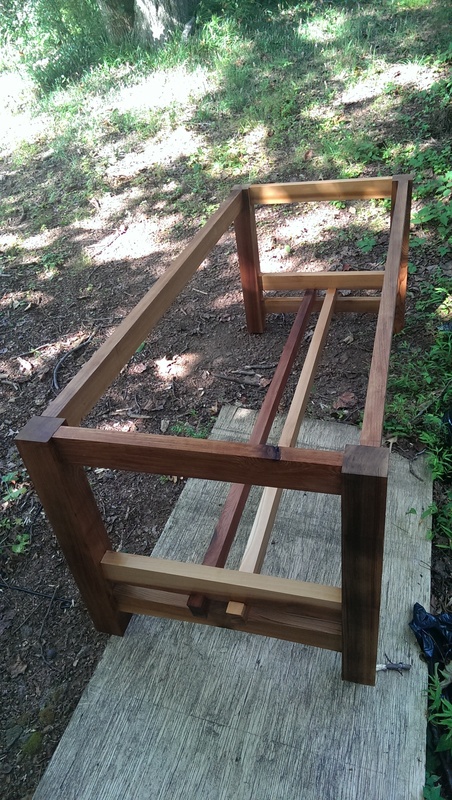 I am going to go ahead and cut to length the table leg pieces and set them off to the side. I won’t be making the mortises in the legs or cross pieces until all the parts for that are ready to go. I’ll need to mock up the entire trestle and make sure all my lengths are correct before I start putting holes in the wood. Saturday I was able to get out to the workshop and continue working on the four boards I had processed. These boards were for two short base pieces and the two trestle parts. On the boards with the short pieces, the remainder will be used for the long base pieces. I cut the boards to what I needed for the longest section on each board, then ripped the needed supply pieces to the correct width. Due to the precision in which I need to make everything fit together, I had to head back into the house and do some reworking in Sketchup to make sure all my lengths were correct. 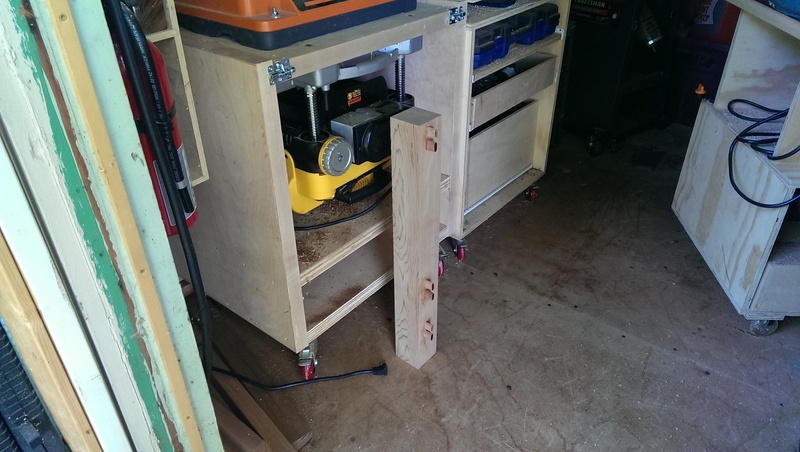 The modified plans called for 2.25″ square legs and mine were nearly 3.125″, so some adjusting was needed. 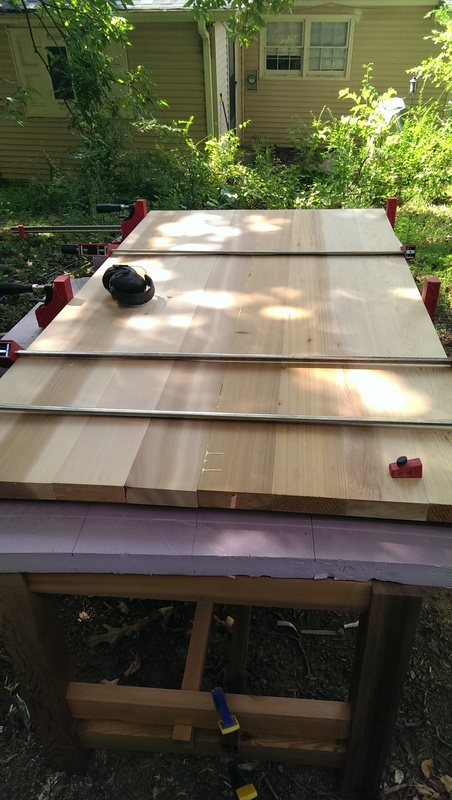 Since the table top is going to be 84″ long, I didn’t have to cut anything down. I marked on the two short end pieces and the trestle pieces where I had to cut the dados for everything to interlock. To continue I will have to process all remaining boards. I need to start mocking up more of the base, and to do that I’m going to have to start cutting up a lot of boards. I’ll also not have the room to continue pulling boards out to process, so might as well get it all done now and let it cook. I didn’t have much of a problem with it warping, so I’ll pull all the boards out, run them through the jointer and planer, and then put them back so they’re ready to go.